Every time we place a trade in the market, we enter what I call “The Gray Zone Of Randomness”. 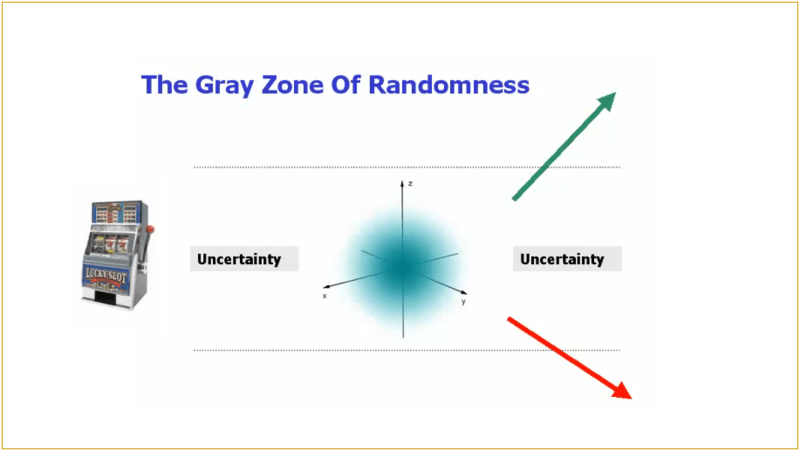 What is the Gray Zone of Randomness you ask? Think about it this way. Even if we have the best trading setup ever invented, the instant our trade gets filled, we can be exposed to news-induced price movement that is not governed by any known rules of technical analysis. No matter what the technical conditions are at that point in time, we pass into a quantum zone of news-related uncertainty where even the smallest bit of news that hits the airwaves can have a drastic effect on the markets and cause rapid price changes either for or against us. Since the news cannot be predicted, and is unknown until it occurs, there is no way to incorporate this important variable into any trading decision-making process beforehand. In other words, no matter how perfect the technical trade setup.. the news can screw it up once you are in the trade. Unfortunately, no matter how experienced ANY trader is, or no matter how sophisticated ANY trading system is… there is simply no way to overcome this news-related barrier. This is why a “Holy Grail” trading system that never loses is impossible. Lets review some examples of why you will never win on every trade. Lets say you have the perfect technical setup on your E-mini chart. Unknown to you or anyone else, a big institution is just getting ready to unwind a large Emini position that they have been holding since the open. By sheer coincidence this coincides with a price level just a couple of ticks above where you took your Long entry, dumping large lots of contracts for sale into the momentum of new buying pressure. The size of the institutional sell orders easily absorbs all the buying pressure and sinks the market and knocks you out of your long trade with a loss. The perfect technical trade setup ends up costing you money due to unknown factors which affected market behavior just after you took the trade. Or lets say that you Short the market on a really good technical setup just below heavy resistance. Overall its is a selling day, you can clearly see a downtrend in progress on the charts and so you are trading in the direction of the trend. You enter Short at a key breakdown level looking for trend continuation in the direction of the overall momentum. In fact this shorting trade setups looks so good and is so obvious it start attracting lots of traders to get short in this same exact area. (one thing to remember about shorting is that when you short you automatically become a buyer to exit your position – this counts as buying pressure just as though real buyers are stepping up to the plate.) At the very instant you get filled on your Short Position, a news event hits the airwaves on the other side of the globe that instantly changes the sentiment of market participants. Even though the news is far away and fleeting and won’t amount to a hill of beans by the end of the day, its just enough to send tiny ripples through the markets causing the price to temporarily rise in the E-mini Futures. Prices suddenly pop back against the heavy short positions that have just built up in the market at your entry area causing the short players to start tightening stops and liquidating positions. Remember.. Buy To Cover. The more the shorts bail on their trades, the more buying pressure gets created and we may end up with a massive short squeeze which can cause the market to cut right through any technical resistance levels like a hot knife cuts through warm butter. We experience a Perfect Storm – failed Short Entry. First an oversupply of short positions at a particular price level followed by an unpredictable news catalyst that spikes the market igniting a short squeeze situation which blows right through our stop. (Without the unexpected news hitting, that trade was probably gonna work just fine.) The Holy Grail of trading, i.e. a trader or system that wins 100% of the time, does not and cannot exist. If you are searching for the Holy Grail of trading, stop wasting your time and start focusing on what can actually make a difference in your trading results. Once you as a trader accepts the reality that no system or strategy can win all the time you can begin to understand that – besides Precision Trade Entries – its all about trade management, controlling risk and minimizing draw-downs. In other words we have to do everything we can reduce the percentage of full stop-outs and to shave losses down on trades that look like they are about to fail. Its all about understanding how to skew the mathematical probabilities in your favor that helps you create and edge for yourself in trading. The first thing we can do to reduce the number of full stop-outs is to trade using a Delta Neutral strategy, i.e. take half the table at a quick 3-tick target and move the stop up equal distance on the remainder. In this way you create a no-lose (or close) position. Starting off with a precision trade setup, you are betting that you can hit a 3 tick target before the market can run against you twice that distance. If your technical setups are good than you put the odds in your favor that you can achieve this easy target more often than not. The entire battle at first is to get filled at your delta target! There are basically 3 ways a trade will follow-through after you take an entry. (1.) The trade will take off quickly and hit your initial 3-tick delta target with ease getting you to safety. (2.) The trade will have trouble getting off the launching pad, price will waffle around for a bit above/below your entry point before taking off and hitting your 3-tick delta target. (3.) 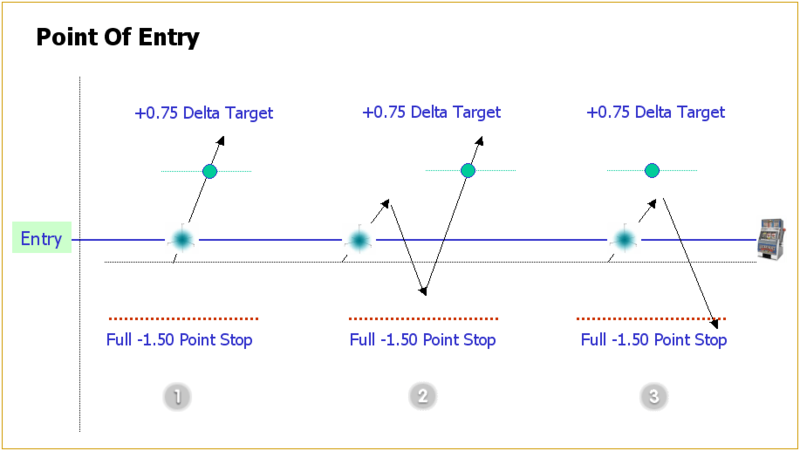 The trade is unable to reach your Delta Target and eventually runs against you to hit your full stop-loss. So far so good. We can increase our odds and reduce full stop-outs by getting to delta neutral. But what if a trade is having trouble getting filled at your 3-tick delta target? Do you just have to watch your trade run all the way against you and hit your full stop? Is there anything that can be done to prevent this? The answer is Yes. There is a point for many trades that are not going to follow through, where they begin to exhibit signs of failure. The Power E-mini Momentum system has been designed with logic that detects these trade failure warning signs and alerts a trader to tighten their stop to a specific price level. To play defense on a bad trade, a trader can either attempt to scratch the trade at Break-even or begin to cut the position size down quickly in an effort to reduce the loss. FACT: You will not win on every trade. (You cannot overcome the Gray Zone of Randomness). The Good News is that you can enhance the probabilities of winning and increase the odds of becoming consistently profitable by playing strong defense on trades that are not going to work out vs. simply watching them move against you to hit your full stop. Once you join Power E-mini Trading and start receiving our fully Automated System Trade Signals and Market commentary you will learn more about how to employ crucial Trade Management Techniques that help you keep your losses small.